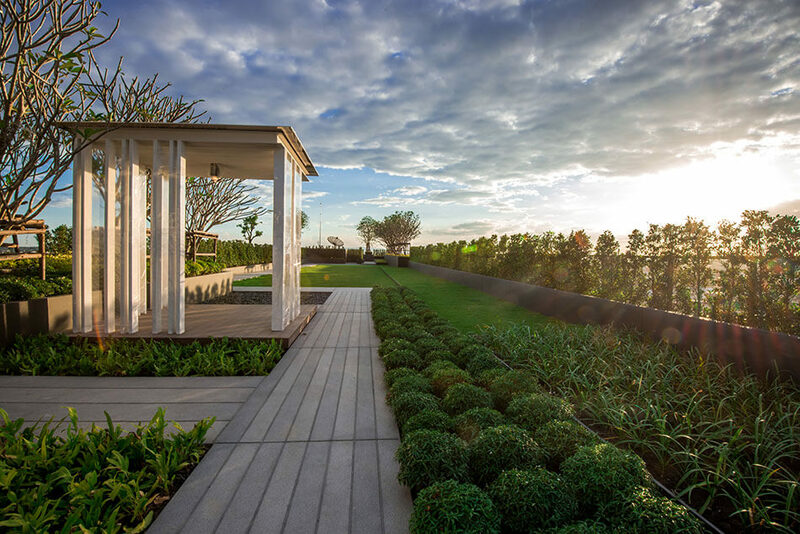 Landscape Collaboration is an integrated landscape design company based in Bangkok, their open design method has created valuable space. They shape their design and its environment through the collaborative design process centered around people and nature. The works of them manifest creative solutions which are the integration of cultural and environmental concern through professional practice. 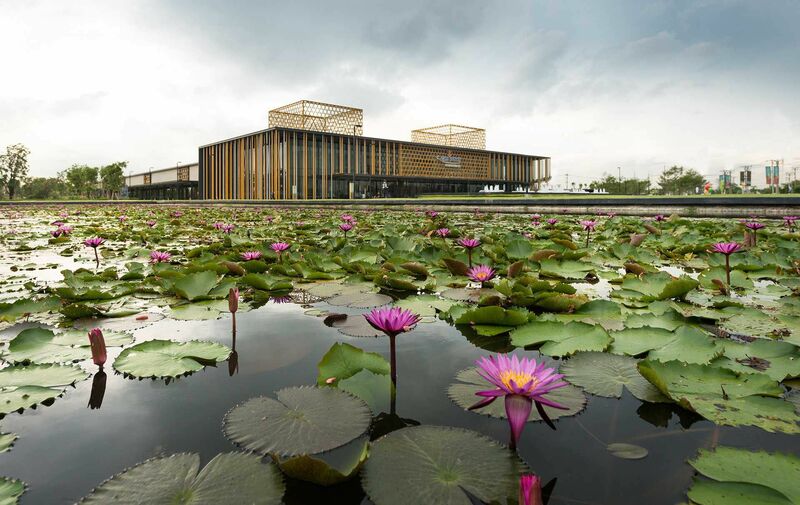 Mooool focuses on landscape architecture industry. 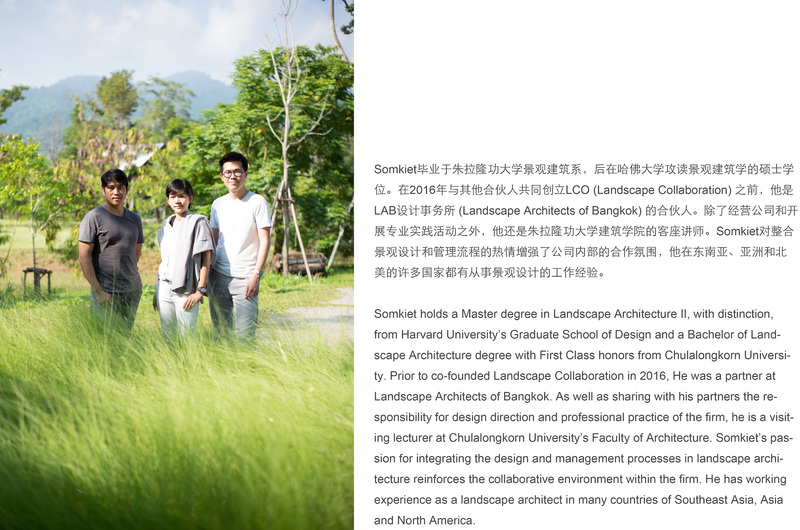 In today’s interview, we introduce Somkiet Chokvijitkul, Principal and Partner of Landscape Collaboration. We interview the prestigious design company around the world every quarter with the passion for showing the excellent design ideas. As the founder of LCO, could you give us a brief of the relationship between you and LAB? 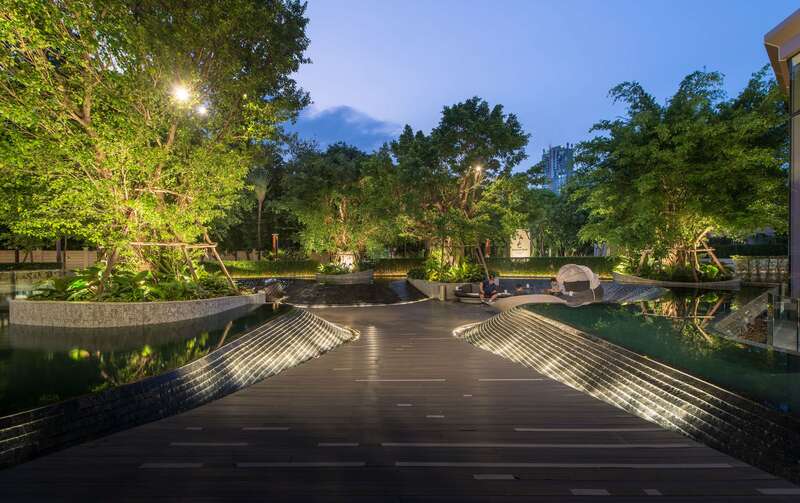 Landscape Architects of Bangkok (LAB) has four partners. We had been running our office from 2009 -2016. Due to the different approaches between partners, we decided to close LAB. 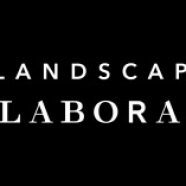 Three of Four partners from LAB have established Landscape Collaboration (LCO). Years of experience that we have developed during LAB are continuing in more collaborative effort within new studio environment. Most of your projects show a high quality on site, what kind of efforts did you do to achieve this? Such as model deduction, construction control and arrangement of work progress? We concentrate on how our design can be crafted during design process. We try to make sure that every details should be appropriated for the construction technique of each project. Design has to be as clear as possible. Once we have everything clarify, then we could advise and monitor the construction work. Although it is impossible to avoid any conflict during construction, we would try to work around it. We often visit the construction site in order to make sure that the design intent will be built correctly. Also, in some projects, we might even help to arrange softscape design by our team of designers in order to get the effect that we would like to achieve. We are fortunate that we have clients that understand the value of built and design works. Otherwise, good design intention alone would not be enough for creating good built projects. It requires a good collaborative effort between owners, designers, and builders. What kind of landscape do you prefer? And what kind of landscape experience do you want to bring to Thailand? Any kind of landscape design has its own unique set of problems and design solutions. We are interested in various kind of landscape design projects. 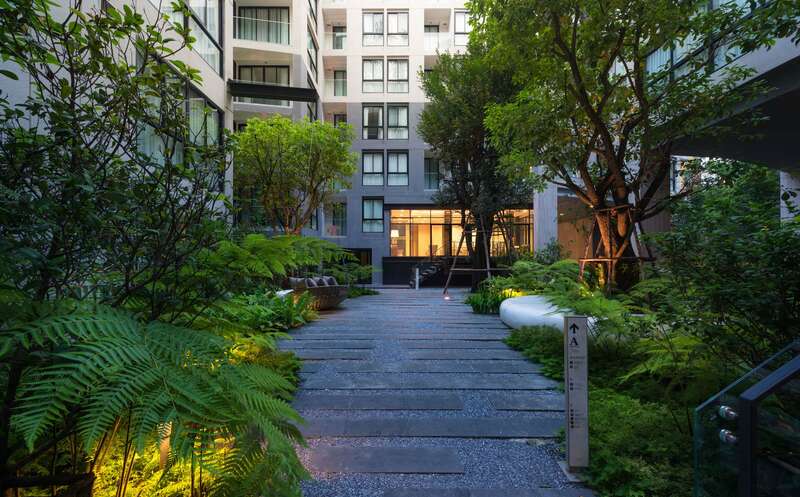 Our design approach focuses on how human and nature can be co-existed in specific space by using landscape design technique to create that harmony. 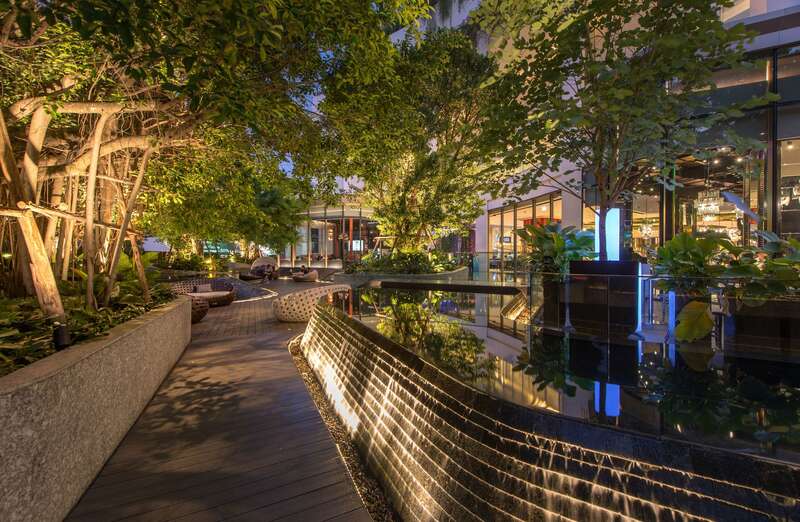 We concentrate on quality of landscape space itself: Functional, Comfortable, Friendly, and Delightful. We think good landscape design should be functional. Function sounds like a very mundane when we talk about it within the context of design. But the a good landscape function could provide so much more for people who using it. These functions can be visible and invisible. For example, the physical objects such as walkway and seating are the obvious functional elements in the design. Everyone can experience it everyday. However, one could feel the differences between the good functional design objects and the bad ones. These elements must be carefully designed and arranged to provide better tangible experience. They are there to serve their functions for the space. In contrast, the invisible function could also be more interesting. 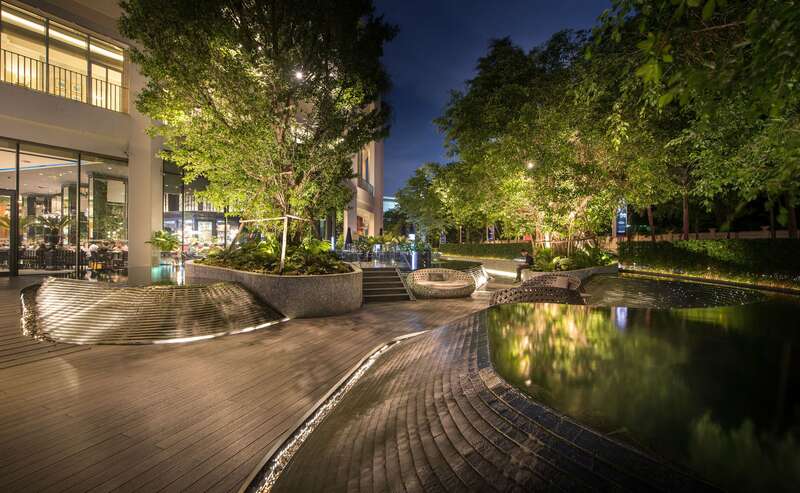 Landscape design could provide invisible function that helps both human and environment. 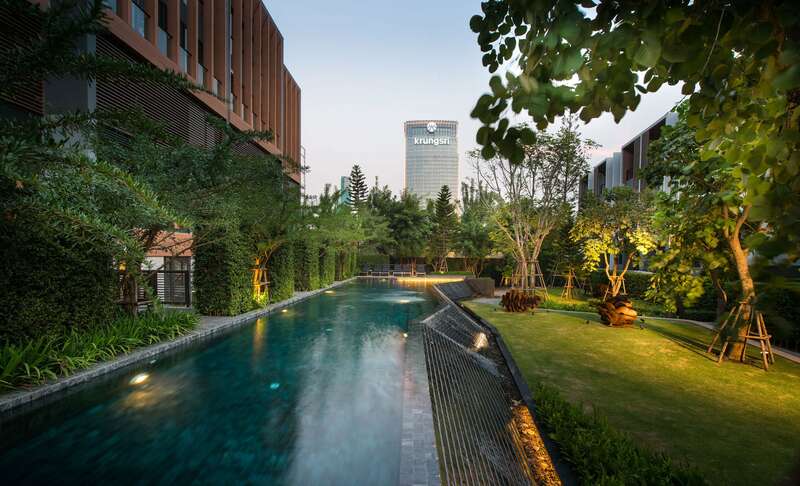 For example, Water feature can be designed to add moisture to cool down the place, and landscape could purify waste water and re-use it for irrigation, etc. When design is function in both operative and environmental level, the sensation aspect comes to play. Landscape design space should be comfortable. It should have an appropriated scale that accommodate people within the space itself. One could imagine how comfortable it is when we are in the interior space, but it might be a bit difficult for people to feel that quality in landscape. It is because we can not control weather in outdoor area, especially, in a hot climate of Thailand. In order to make it comfortable, we need to create a better micro climate. Once the landscape design is functional and comfortable, it should be welcoming people to use it. Friendly and safety in our design is our great concern. 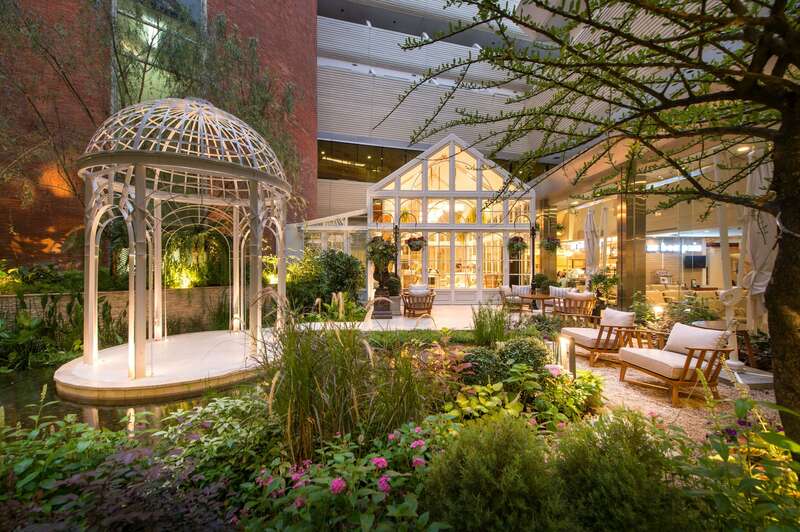 Good landscape design should not only be a visual pleasing space. We believe that the interaction between people and landscape design will create a better atmosphere for the landscape space. 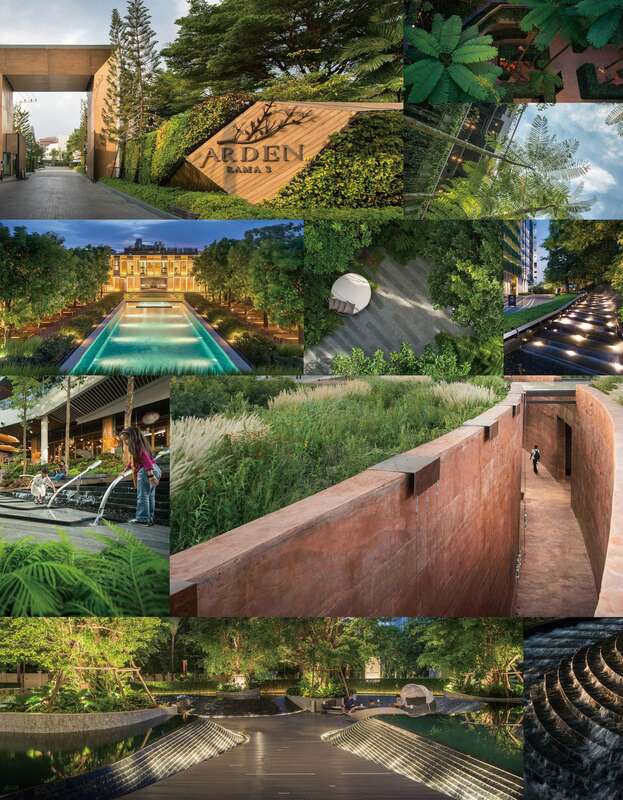 In other words, people activities are part of our landscape design. Last but not least, the delightful within landscape is a light touch for our design. It is about the overall perception of space that we want to emphasize. Texture of materials both hardscape and softscape, sound of water, scale of space and their arrangements, etc. are parts of the combination that make a delightful experience. We hope that people should feel different in the optimistic way when they are within the space that we have designed. ▼景观的材质肌理、水的声音、空间尺度及其排列都是构成愉悦的体验空间的一部分 Texture of materials, sound of water, scale of space and their arrangements are parts of the combination that make a delightful experience. 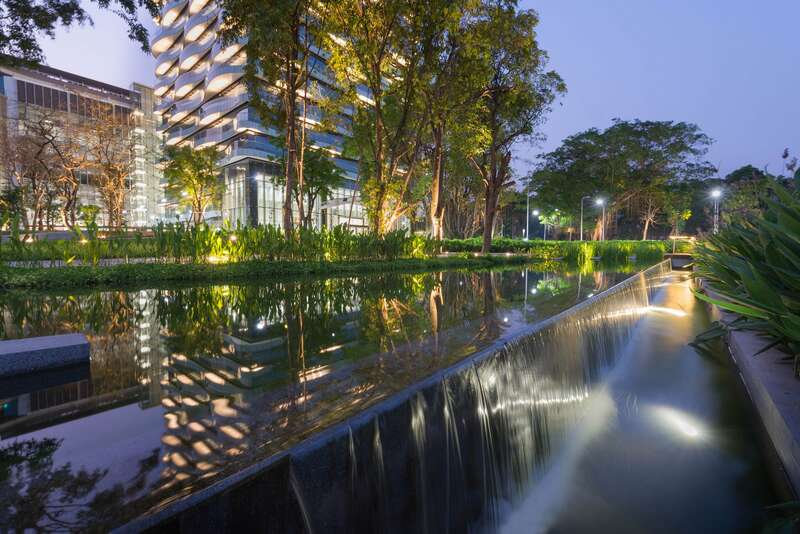 Now Bangkok is prosperous and bustling but crowded, with a few urban green spaces and leisure spaces. 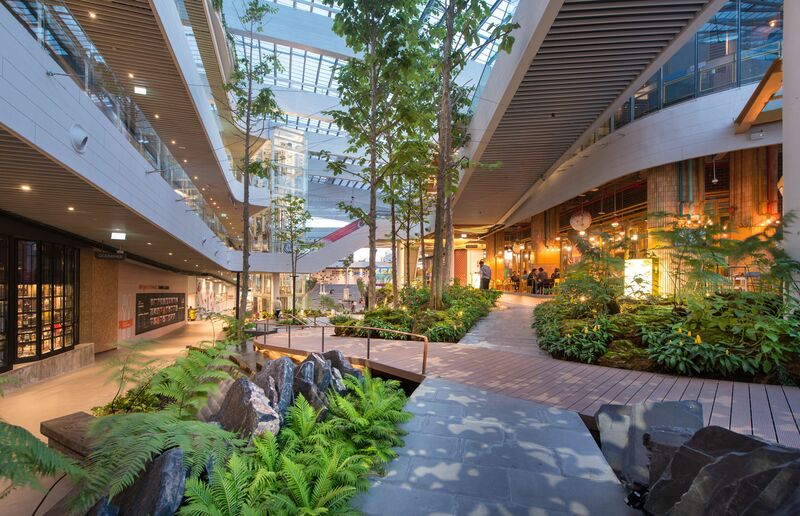 Your two commercial projects “Central Festival East Village” and “Mega Foodwalk” are both full of green, what kind of design conception in it? We had such a great opportunity to involve with these two projects. There is a shift in the thinking from clients of how commercial space should be. In the hot climate of Thailand, most people go to shopping mall to hangout with their friends and families. It is convenient for them since everyone can get anything from shopping mall. Why don’t they go to park? Some people do, but some don’t. We all know that park is important then why don’t we try to integrate it with the place where people would like to go. That was the initial idea that we try to add to the project which was fit with the design requirements from the projects. 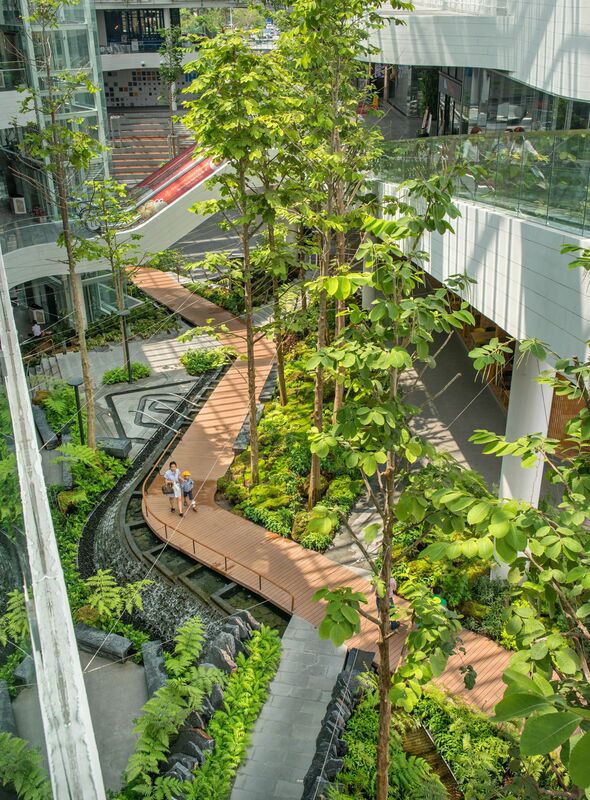 For Central Festival East Ville, the design concept is to create a hyper natural landscape within the shopping mall. 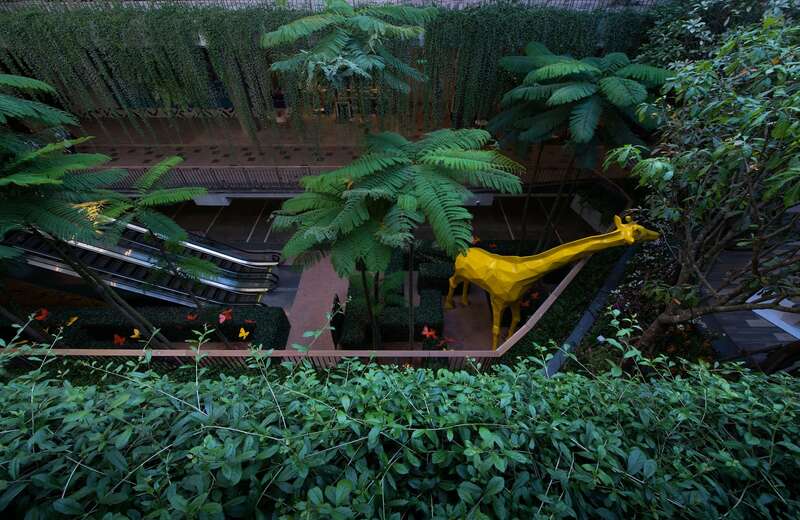 It contains surreal elements of abstract animal sculptures that would create atmosphere of urban jungle for the project. 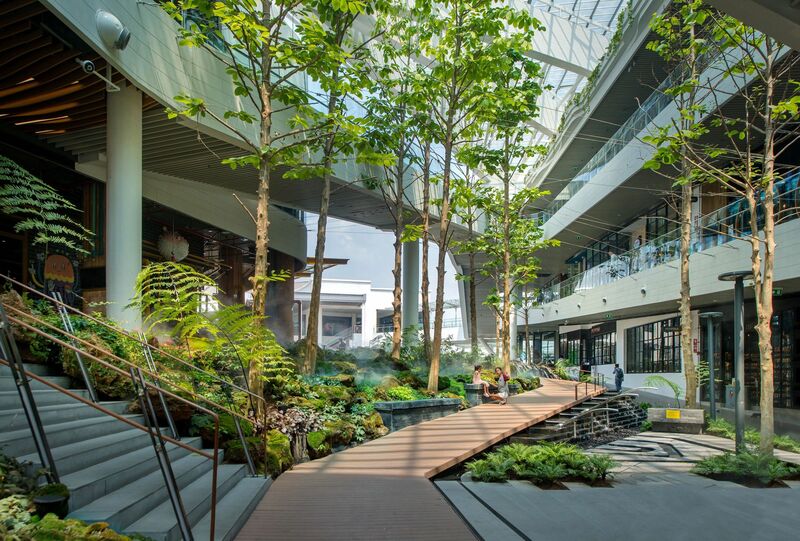 The landscape atriums become space of interests where water feature and sculpture interplay with seating and commercial space. The corridors in front of both-side shop-fronts are covered by vines. 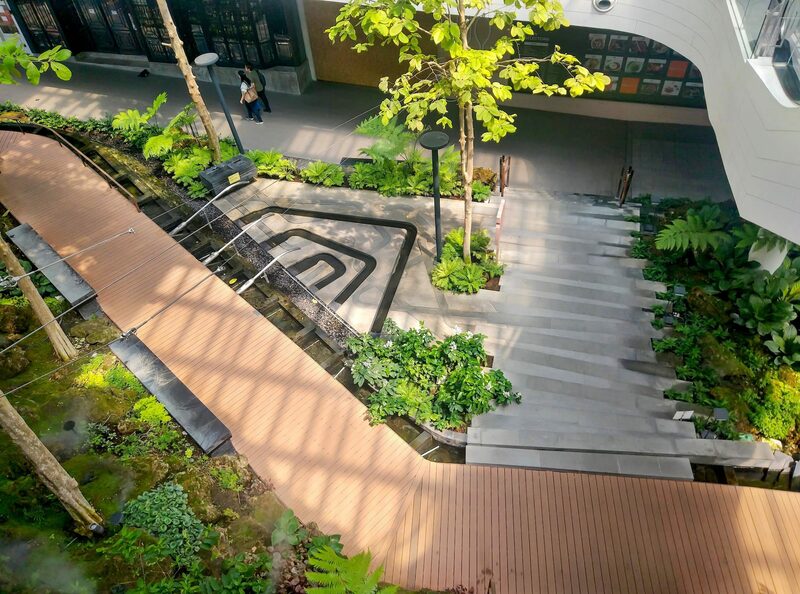 We tried to create a soft separation between the walkways and the rooms inside the atrium. The vine will become green curtain from walkway that also acts as a green backdrop for the atrium space as well. It is soften the entire atmosphere and diminish the presence of building as if people were walking in the true natural valley. 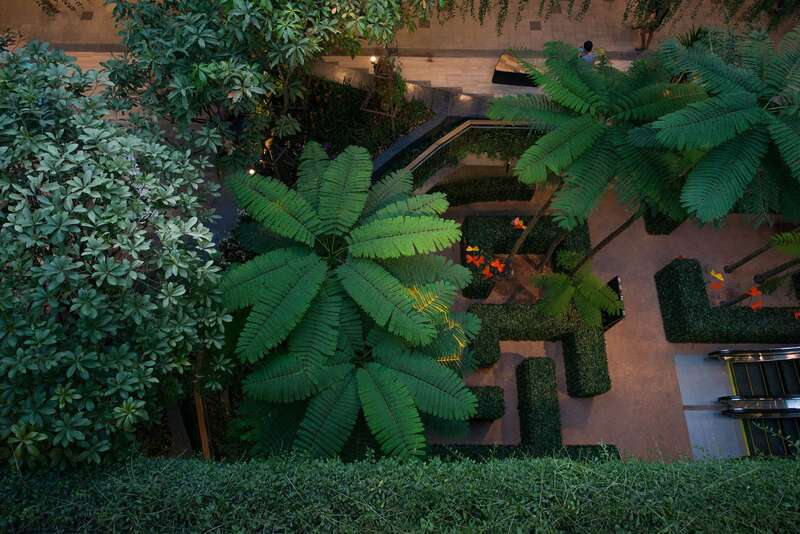 People could enjoy the indoor to semi-outdoor and outdoor space through the surreal landscape design. ▼Central Festival East Ville购物中心，加入抽象动物雕塑的超现实元素 The “urban jungle” project contains surreal elements of abstract animal sculptures. 植物柔化了整个场地的气氛，消隐了建筑的部分体量，营造出“城市丛林”的体验感 The green elements soften the site and diminish the presence of building as if people were walking in the true natural valley. 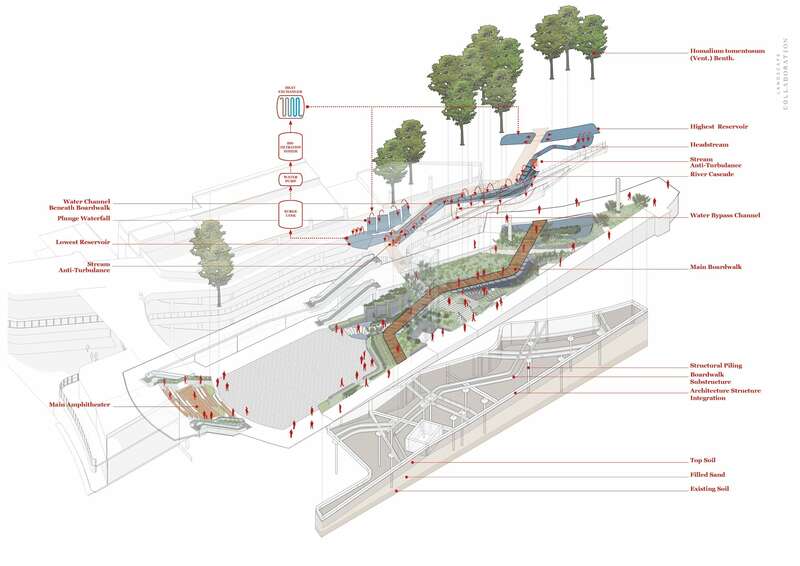 For Mega Foodwalk, the main goals that landscape design is rather a radical design approach. 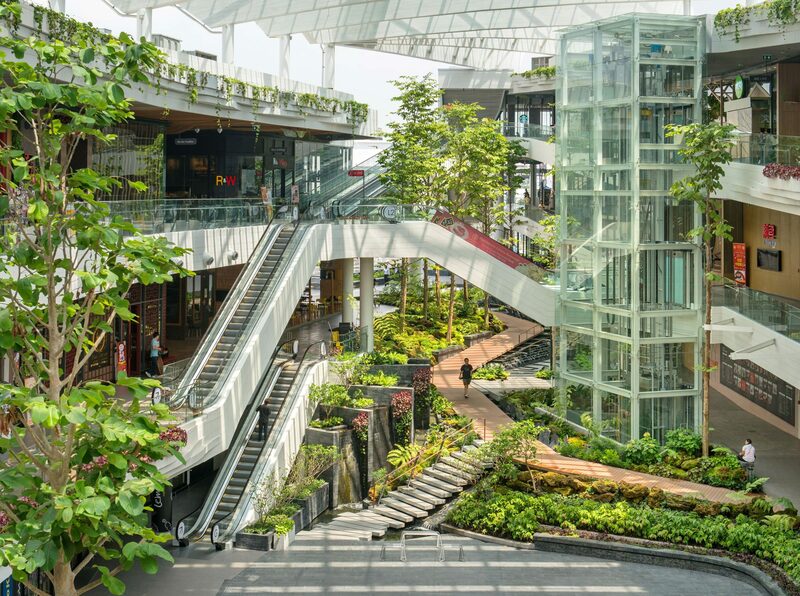 We have to create landscape that deal with level different from architecture and existing shopping mall and yet still accessible by all ages. It should also be a very comfortable space for people to hangout in the outdoor area. Since the landscape is not flat, we have to deal with the slope in 3 dimensional ways. 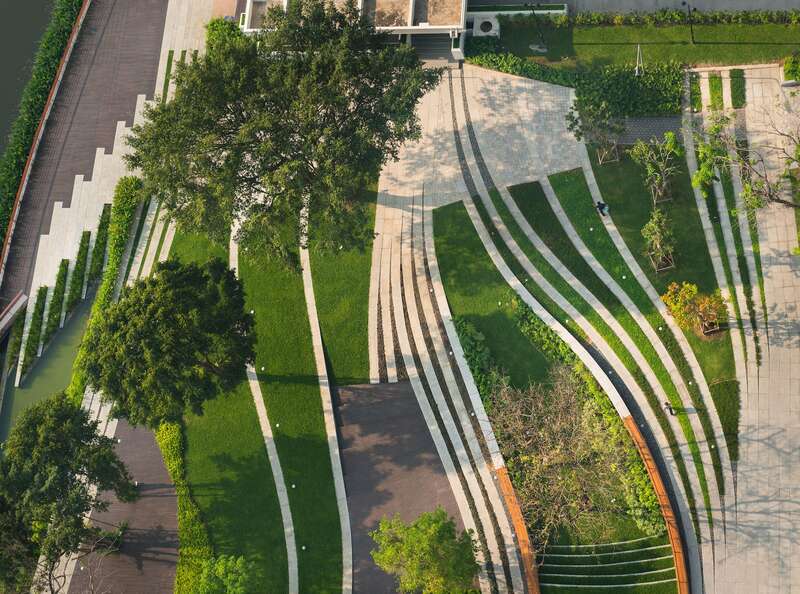 The main walkway, slope 1:12, was established in order to create a main circulation where everyone could access to the garden on different level. 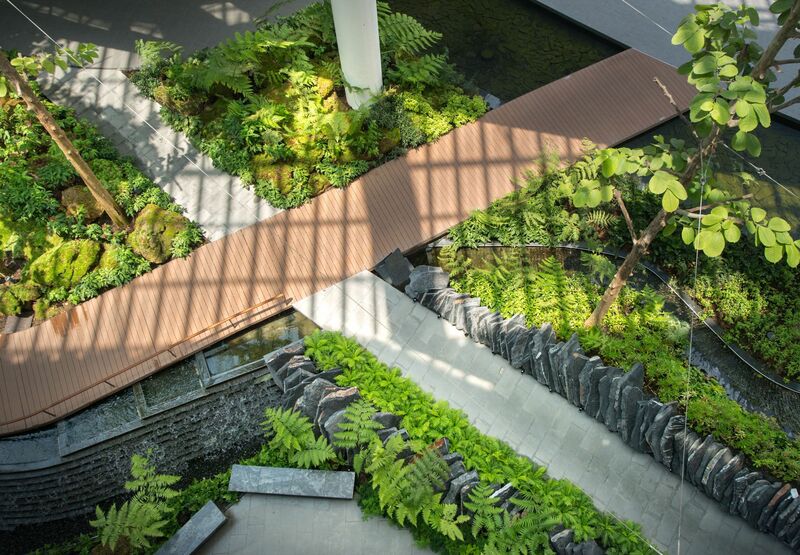 Along with the walkway, water feature with different fall textures are integrated. The water feature was not only a feature, but was also a physical barrier to prevent drop from different levels. It also provides moisture for cooling the space. Seatings were arranged in the area that could receive the moisture and the airflow. The overall design structure are very rigid with constraint. In order to refine it, fine textures of finishing materials and softscape palette were introduced. Slate stones slab were placed as retaining wall that create rough texture in contrast of fern that has very fine leave texture. The contrast between rigid structure and different material textures create a delightful atmosphere that is unique for the project. 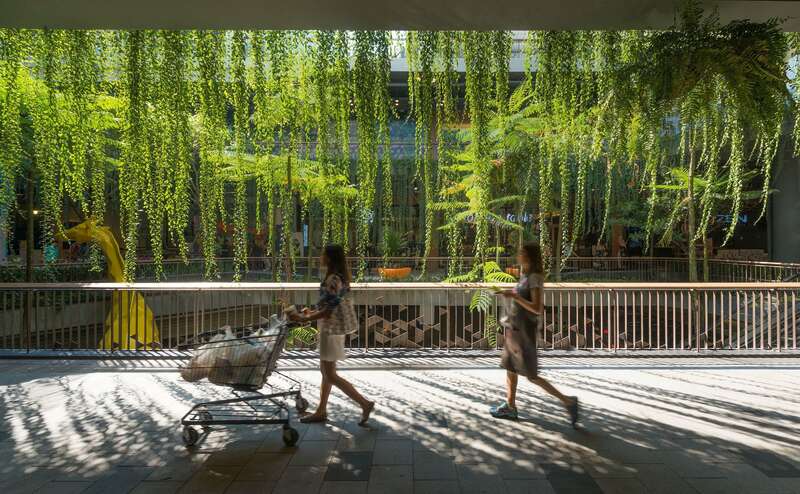 In contrast to Central East Ville, landscape design for mega Foodwalk embrace the presence of architecture, yet both projects demonstrate the surreal atmosphere by using landscape design. 设计采用不同纹理材质的水景沿着人行道布置，帮助场地降温，营造一个凉爽的活动空间 The water feature with different fall textures are designed along the walkway, which provides moisture for cooling the space. Could you share some experiences in practice of micro-climate in landscape for tropical areas? 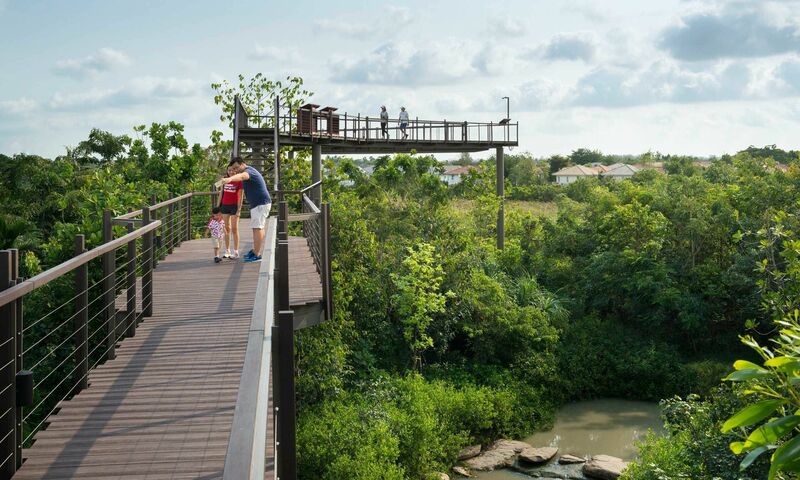 As a landscape architects, we want people to enjoy using outdoor space. We experience many great landscape design projects that are beautiful but no one really using it. 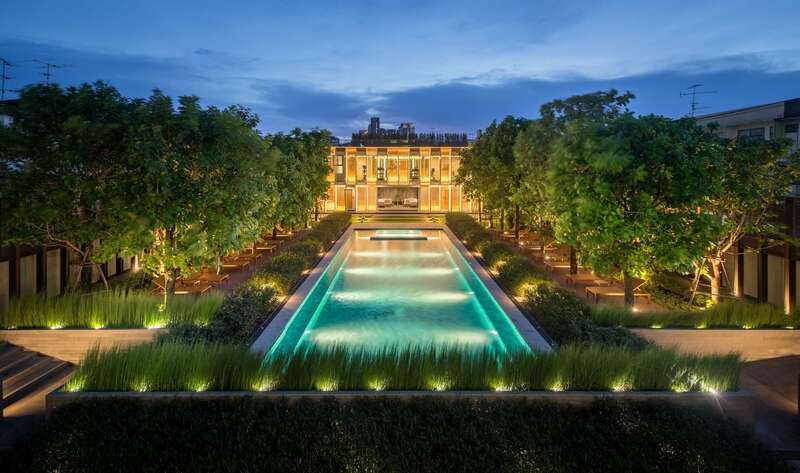 It is a big question for us which we also realize how difficult to create a landscape design that encourage people to come out and use it in a hot climate. Normally, we do not need to have a very cool outdoor space. We just need a cooler space that would make us feel more comfortable. Then, we think since we cannot control the entire atmosphere, we would try to create pocket spaces that would have better micro-climate as close to the human comfort zone as possible. From our experience, we notice that if we can make a space that people could feel the difference in temperature, then they tend to come out and use outdoor space. “暹罗典范购物中心美食区庭院”的水景和植株帮助场地降温，是一个接近人类舒适区的微气候口袋花园 The plants and water feature in Siam Paragon Gourmet Garden Zone help this pocket space creates better micro-climate as close to the human comfort zone. How to combine landscape design with construction technique to achieve a virtuous micro-climate cycle, in your opinion? 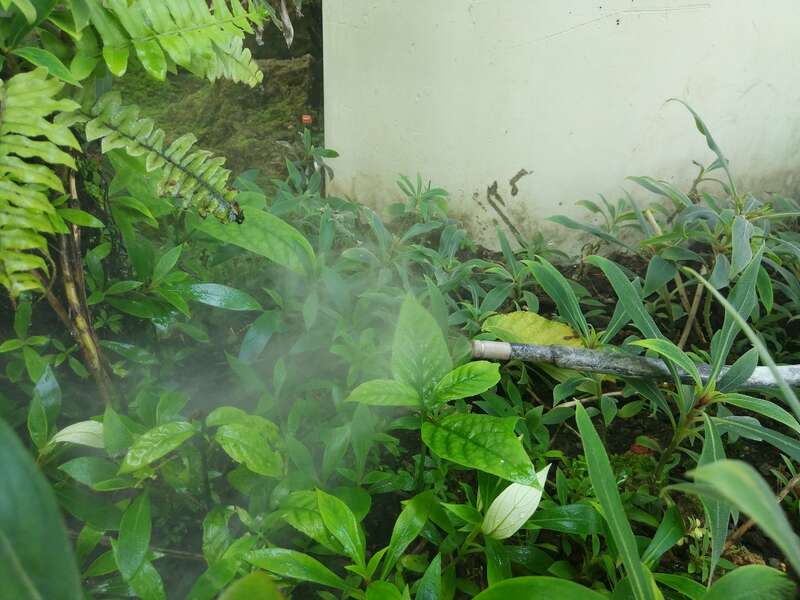 There are three factors that we should concern about the micro climate in tropical area: direct and indirect heat, temperature and humidity. 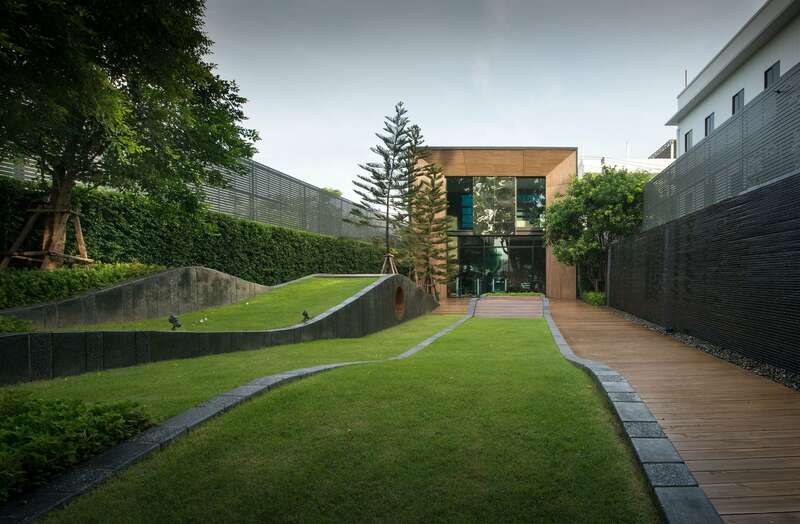 We can use a good planning for space orientations in order to enhance shaded areas or avoiding direct sunlight, the good landscape design orientation will also provide a good air ventilation for the space. We could use planting design to mitigate heat problem as well. The velocity of airflow then could be control by using softscape design. This combination helps to reduce temperature and make people feel more comfortable. This is a technique that the design teams for Mega Foodwalk has implemented. 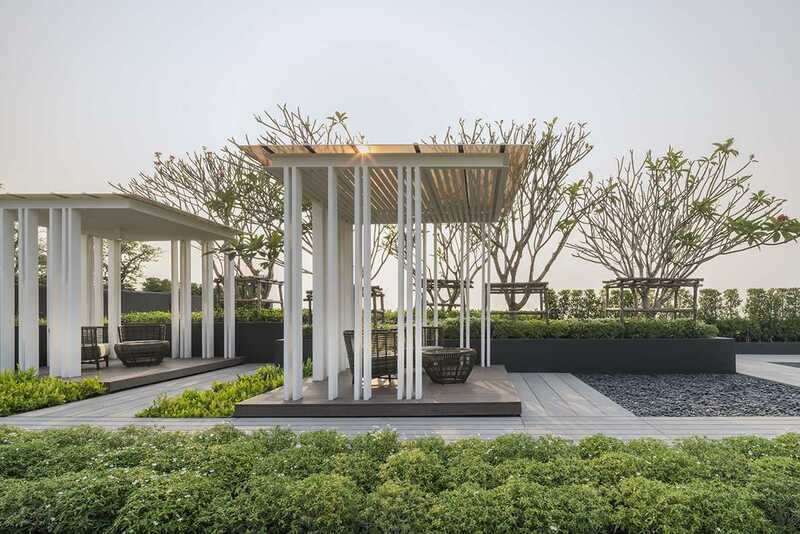 The atrium space is located in the North-East and South-West orientation in order to capture the prevailing wind of Thailand. The arrangement of landscape inside also creates a valley space that allow air flow to go through. Also, the cross ventilation of the roof section helps to ventilate the hot air, which again bring air flow into landscape space on ground level. Tall trees is designed to locate in the areas that could get the most sunlight. This not only provides a better condition for the trees, but also uses the trees to create shaded areas for people at ground level. The shrub at ground level then preserves moisture. Moisture provides cooling effect if we use it correctly. However, too much moisture could be negative effect as well. We need to consider about moisture from water feature and planting in our landscape work. If we can balance it, then comfort zone can be created. There is no any certain formula, but each site need to be analyzed carefully. In the case of Mega Foodwalk, We provide a long surface area of water feature with various fall textures in order to provide more moisture. Also, we use fog system for mosses and fern. 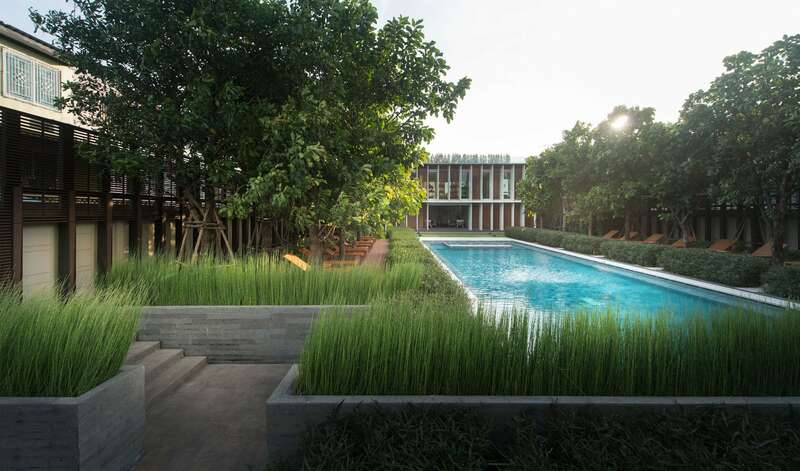 The additional moisture from landscape design is enhance the dry air of mid-day in Samutprakarn. In certain area where there is no air flow, the engineering team has provided the jet nozzle to create air flow. In order to achieve such success micro climate oriented project, everyone in the team must work together with the same goal. This is a collaboration between multidisciplinary. 苔藓和蕨类植物使用的喷雾系统能为场地增加湿度，帮助实现以微气候为导向的设计 The fog system is used for mosses and fern to increase air humidity, which helps team to achieve this micro climate oriented project. In the man-made landscape, in what way to deal with the relationship between human and nature? Plant, material and so on, for example? Man-made landscape can be defined in many ways. In the case of plaza design in urban area, the aspect of nature we could use might not be appropriate for the utilization of the program. In other case of park or hospitality design, then the aspect of nature will be more obvious. The essence of nature should be represented in landscape work. People should be able to feel it. We are not trying to mimic nature into our design, not the way it looks, but we want to get the abstract of nature in order to create something different. We still use stone but it might be presented in different way than a natural stone in nature. So that the landscape design is clarified with specific design intent. Although it is part of nature, it is a curated nature that is blended with culture and human needs. 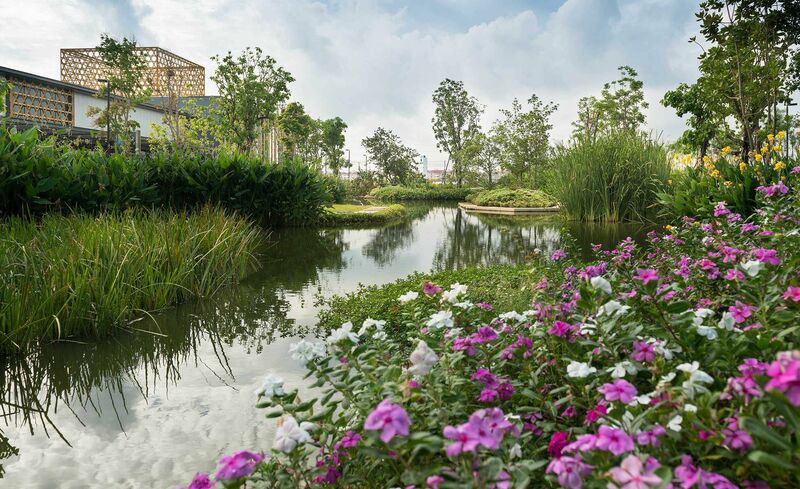 In the end, we hope people would enjoy the landscape design that interpret nature in the new way. 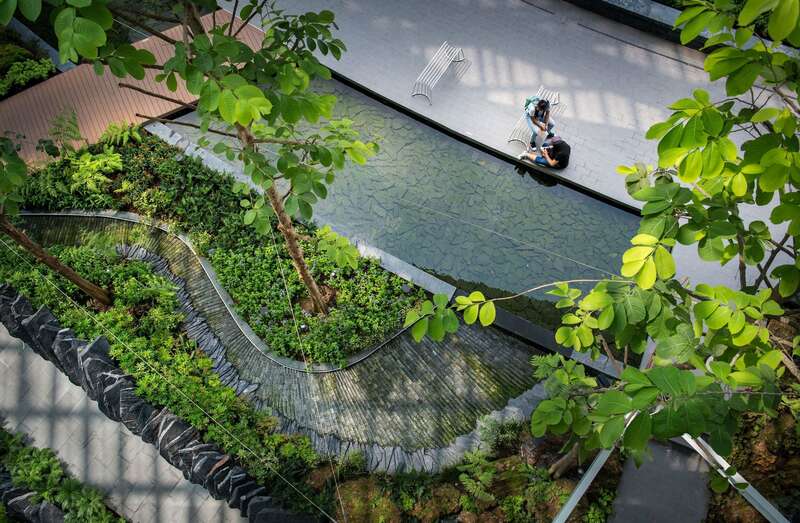 What kind of role does plant play in landscape design? What kind of plant design methods in your advocation? Planting is a heart of landscape design experience. We use planting to define and differentiate space. It is a soft touch that could create a great atmosphere for any spaces. We prefer to use native species for most of our projects. The native species will be more robust and ecological sustainable. We do not have any specific way of handling or arranging planting in our projects. 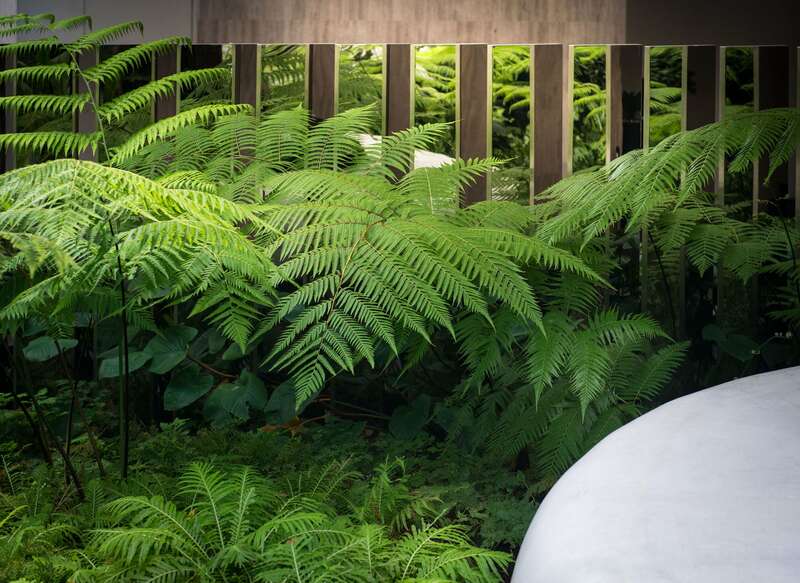 Sometime, only single species of plant could create a strong impression of space. However, we also prefer to have variety where it is appropriate. ▼单一植物种植策略，营造出强烈的空间感 The single species planting strategy creates a strong sense of space. ▼混合种植策略塑造层次丰富的植物空间 The mixed planting strategy shapes rich layers in landscape. Regarding to the environment issue in Thailand today, what exploration and effort have you made? There are many environmental issues that related to landscape architecture profession. The one that is directly related to us is water management issue. Although we could not tackle all environmental issues in the large scale, the smaller scale landscape could help to reduce the environmental degradation impact. We have completed many design projects with zero discharge concept. Rainwater should be captured and reuse for irrigation for landscape within the site. This would help in micro scale for the water management issue. 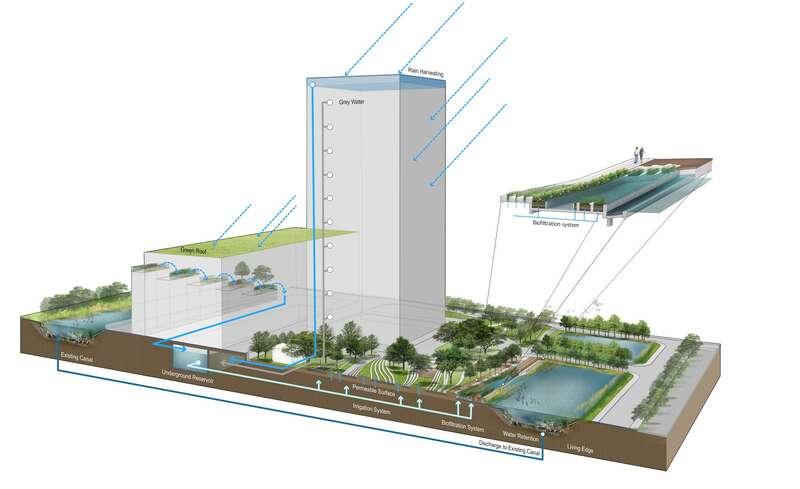 Also, waste water within the site could also be treated by landscape wetland and reuse it. We have experiment this concept and it works well for King Power Srivaree project. 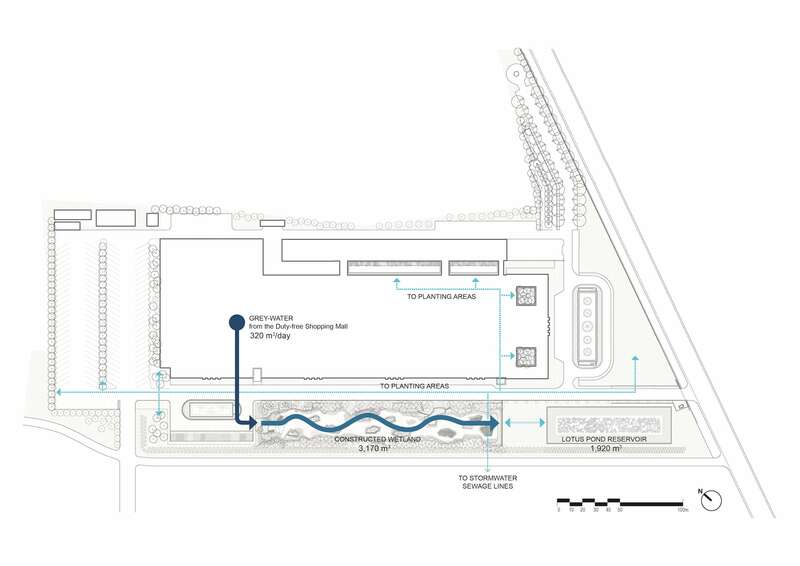 We believe that if we introduce more green area with this active process of water management, we could reduce the use of our water resources by recycle water within the site. 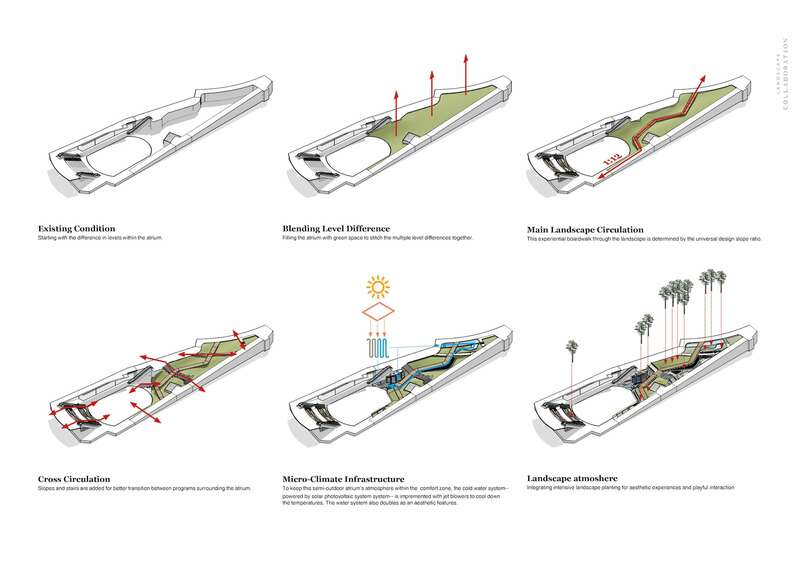 Also, we hope that our micro-climate design thinking would eventually help to reduce the urban heat island effect. We might not be able to change the climate of Bangkok that is only getting hotter. But it would be great if we have more comfortable landscape areas for people to inhabit within the city. 雨水的收集再利用被用于场地灌溉，帮助解决场地水管理问题 Capturing and reusing rainwater for landscape irrigation to help solve the water management issue within the site. 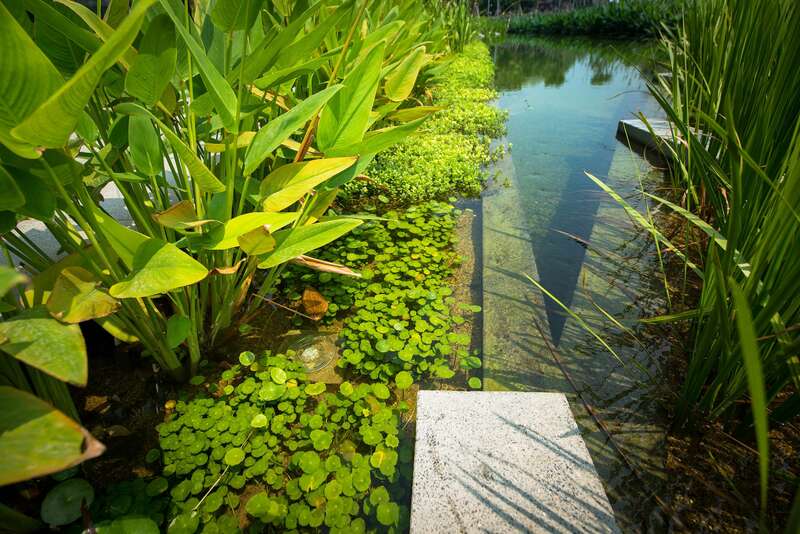 ▼King Power Srivaree- 场地内的废水通过湿地进行处理和再利用 Waste water could also be treated by landscape wetland and reused. How do you think of the prospect of the landscape industry? What the challenges ahead will be? We are living in an interesting time. People now have more concern about their environment which landscape profession is one of the key players in this realm. 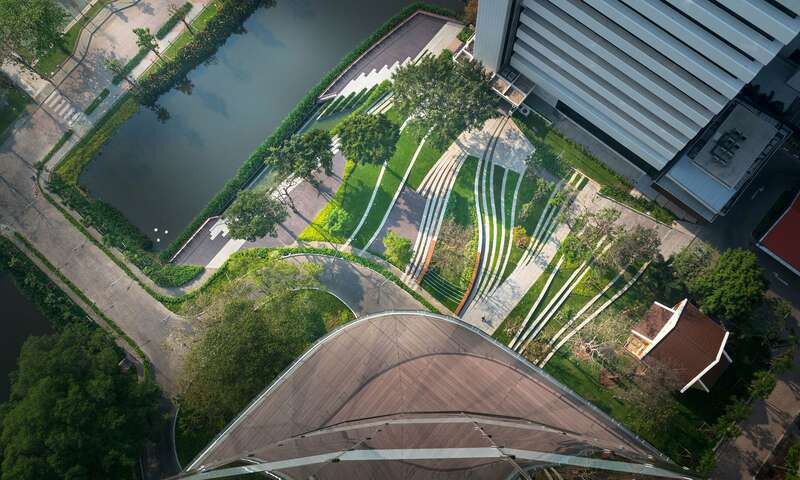 They will slowly recognize how important landscape architecture could be. 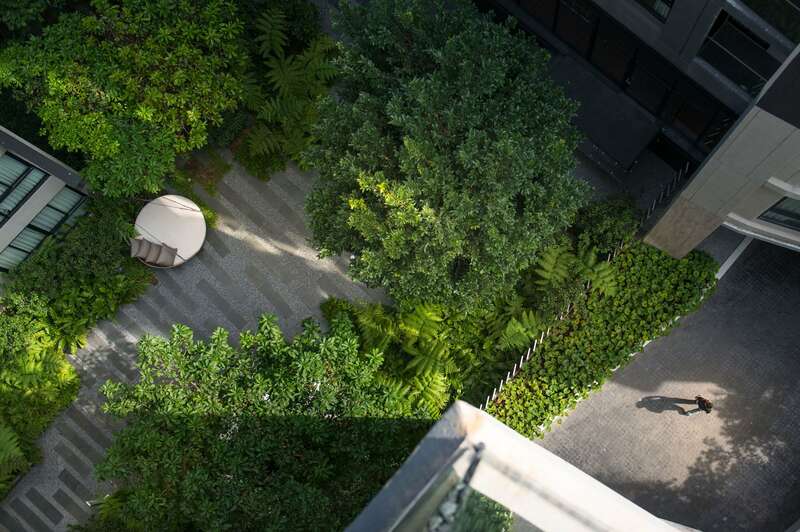 We believe that landscape architecture should not be treated as commodities. It is not a fashion or just a marketing tool to beautify the developments. Instead, we should create our landscape works that present its true value, value added service for human and our environment. 感谢 Somkiet Chokvijitkul 对本次采访的深度配合！ Thanks to Somkiet Chokvijitkul for the deep cooperation in this interview.